I noticed this yesterday when I checked my Adsense account. 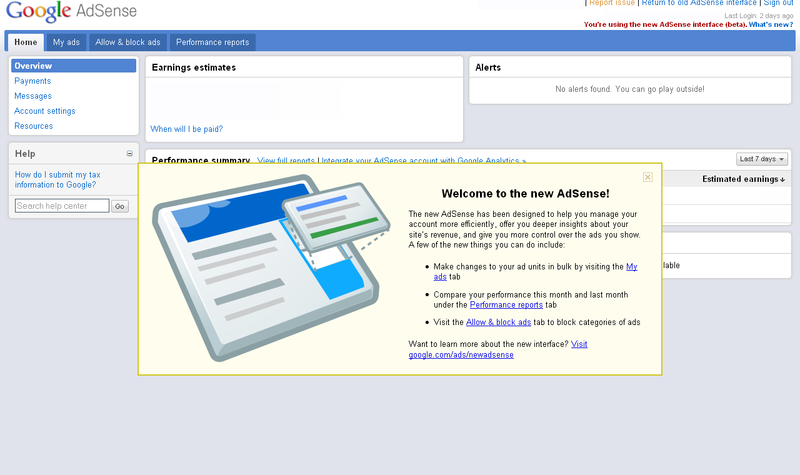 A pop-up came out asking me to try the new Adsense interface. The new interface looks good even if it is still in beta stage. Well, the old one looked... old. The interface is very basic, just using basic HTML. This new interface looks modern. It even has graphs letting you compare your estimated earnings, ad unit impressions, coverage, clicks, CTR, CPC and RPM everyday. 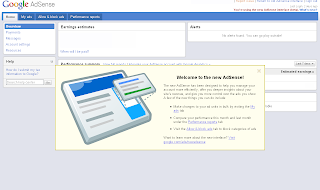 I'm hoping for more improvements to this new Adsense interface as it comes out of beta. First sentence of my first post! I finally decided to use this URL. I might use this instead of Twitter coz I don't see much use in using the service. This means this blog may contain very short posts... like one-liners. That's it for now. I'll try to make one post per day as much as possible. I'm in love... with my Dragonite. He's the best HM slave you could possibly ever have. Being a slave sounds bad, but an HM slave pokemon is very useful and a must in any party. For those who don't know, an HM slave is a pokemon dedicated to using HM moves only, so the other members of your party don't have to learn these Hidden Machines. My Warcraft 3 friend and AT partner "rArA" ("Filipino Champ" in SF4) won a Super Street Fighter 4 tournament a few days ago for a prize of $6000. Good for him to get something out of his hobby! He is quite known in the Warcraft 3 circle as one of the top human players during the early Frozen Throne patches. His character in Super Street Fighter 4 is Dhalsim. Tita Gay (as we call Aunt Grace) arrived yesterday from Hawaii at around 5:30 pm.I think it has been six years since she and her family last visited the Philippines.Their vacation here is in time with Lolo Poling's(Titay Gay's father) birthday on July 27. Of course we're all excited to see tita and our cousins Abigail and Ariel. But what we are most excited about are the balikbayan boxes or simply put the PASALUBONG. Hehe.